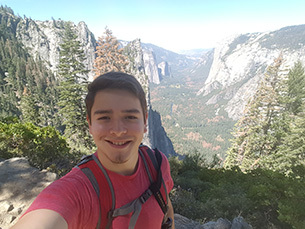 To hear Miguel Aguirre-Morales ’19 tell it, there have been two influential trips in his life. His internships this summer might qualify as a third. The rising sophomore has divided his summer up between two internships: one working at the Santa Ana National Wildlife Refuge in Texas, and the other with the Doris Duke Conservation Scholarship Program at the University of California-Santa Cruz (UCSC). Quite a bit of fieldwork is in his future, not just in Texas, but in and around the Redwood forests and Pacific Ocean near Santa Cruz. 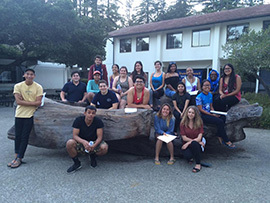 The prestigious program at UCSC selects 20 early-career college students from around the country and immerses them in the field of environmental conservation via research, leadership, and training. His time at Santa Ana focused mainly on organization and public relations, though he picked up birding as a hobby as well. Aguirre-Morales says his first weeks in Northern California have been engaging, not only because of the surroundings, but the program’s focus on leadership, discussion, and teamwork. Ever since he can remember, the Donna, Texas, native has been interested in marine biology. It was a family trip to Acapulco that sparked Miguel’s interested in zoology. For him, it’s always been something related to mammals and the water that captured his attention. During his junior year of high school, Miguel started making big picture connections about the environmental issues facing society today. It was about that same time that Miguel became connected to Wabash College. David Wagner ’05, then Principal-in-Residence at IDEA College Preparatory School in Donna, organized a bus trip from the Rio Grande Valley to the Midwest so the college-bound juniors could explore options for college. In addition to Wabash, the itinerary included schools like the University of Chicago, Wheaton, Maryville University, and Saint Louis University. He eventually applied and was offered admission into the Wabash Liberal Arts Immersion Program (WLAIP), the summer program geared toward first-generation college students, featuring programming for both students and parents that includes exposure to the liberal arts, a summer immersion experience, and opportunities and resources that are focused on increasing individual success. “The WLAIP sealed the deal for me,” Miguel says. “That’s how I met my two roommates. One of the mentors in the program, Jacob Alaniz ’18, is my best friend. He’s been a mentor, he’s helped with chemistry and anything I needed. Miguel has adjusted well to life on campus. In addition to successfully navigating the rigors of introductory chemistry, he’s involved doing research with a professor on campus and in a number of extracurricular activities including the recolonization of Delta Tau Delta, Wabash Acts Responsibly, College Mentors for Kids, and Students for Sustainability. After a busy first year of college and a fully booked summer, the energy level doesn’t appear to be waning for Aguirre-Morales. He’s already pinned his sights on graduate school.